Do you learn more through stories than textbooks? Do you lose interest when something gets so technical and complex it sounds like it was written in another language? Are you ready to make healthy living a consistent priority in your life? If you answer YES then keep reading! The Lean Life is an education about health and nutrition told through a compelling story; instead of the typical dry, boring, textbook format. An education in STORY form, with recaps presented in a very unique way for reinforced learning. You will be able to RELATE to the challenges faced in The Lean Life (formerly titled Every Step Counts). You will learn how the body works! How fats, protein, and carbs work in the body and how YOU can manipulate them to get the body you want! 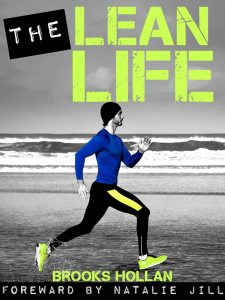 After the story is over, you get your very own FitLife Workbook! Grab a pencil as Brooks developed this workbook when working with high-end clients that wanted a 1-on-1 or small group custom education (over $200 value). Workbook includes goal setting, food lists, the amazing KISS handout, and ONE exercise that will help stop that pesky low-back pain. Over 200 pages of story, workbook, and more! The Lean Life will bring you close to the life of a likable kid named Timmy who finally had to confront his weight in the wake of some family health problems. Follow his journey as he goes off to college and his attempts to not only find, but better himself. You learn as Timmy learns, and by the end YOU will be ready to take action and ultimately set your own path to a healthier, happier future. What if I already know about health, fitness, and nutrition? By reading this book, you will gain clear, concise, and easy ways to communicate what you know to others! If you are a trainer or health professional that works with clients, the story aspect will help you better communicate with your clients, as the explanations in this book are great! Is this book right for you? If you like reading stories, you will love this book. Every Step Counts is a story…and the boy is just one of the characters. As he moves through the story, you will be learning and applying it to yourself. It is not ‘detailed’ just for him. It is there to teach everybody what they need to be doing to be healthy. You will learn how the body works, processes foods, etc. Each ‘lesson’ is recapped with a ‘letter to mom’ which is a like a review of what he learned as he shares his knowledge with his mother. Plus, at the end, there is a 22 page workbook that applies to YOU! If you are looking for a structured, ‘to the point’ meal plan then the jump start plan may be a better option. This book will help you understand ‘why’ the Jump Start plan works so well, so it could be a very good compliment. Brooks has a passion for health, fitness, and educating others dating back to his childhood. He began swimming competitively when he was six, and went on to qualify for the Olympic Trials and NCAA’s. He is a graduate of the United States Naval Academy, an entrepreneur, and a National Academy of Sports Medicine (NASM) Certified Personal Trainer and Corrective Exercise Specialist (CES). He has a passion and a commitment for educating people on the benefits of living a healthy lifestyle. He is also an amazing writer, so I KNOW you will enjoy the story! Get ALL of this…over 200 pages of compelling story, workbook, and more. From a highly qualified individual that has helped a LOT of people! People were paying over $200 each for this education…but you can get it a LOT less on Amazon.com below!